The book “Carved Names Vol. 2” accompanies the inauguration of a monument called “Names in Mortar Joints”. 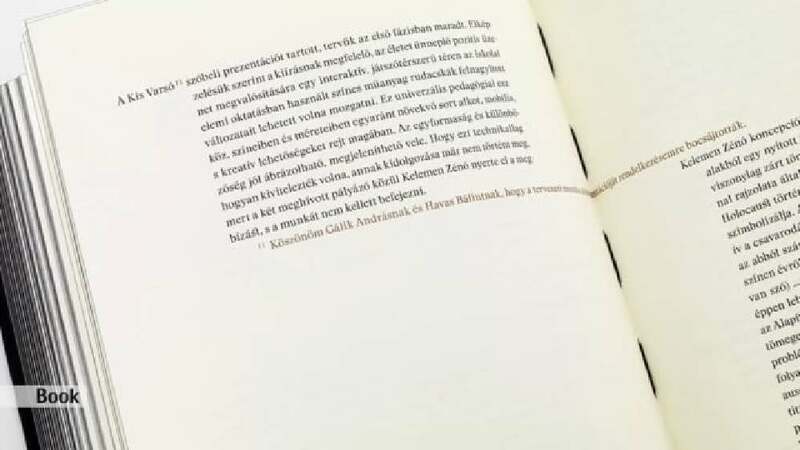 Consisting of a 200-metre bronze strip in a brick wall, the monument at Eötvös Loránd University in Budapest is dedicated to university staff and students who fell victim to the anti-Jewish laws, the Holocaust and World War II. The book features a black cover and contains lectures given at a conference related to the work. Its purist appearance is aimed at visualising the humility of science and the calmness of thinking, and thus draws attention exclusively to the content. A homogenised typography with only one single font and size was chosen as a metaphor referring to the destruction of diversity. “Carved Names Vol. 2” is defined as a space experiment that was designed to correspond to the monument’s architectural space experiment. The “typographical silence” of the design aims to represent the loss caused by the Holocaust. No more than a black box at first glance, “Carved Names Vol. 2” presents on the inside typography at its purest. The book fascinates with design details such as refined indentations and lines that run across pages. In addition, the book is beautifully bound and convinces as an overall concept for conveying a difficult and delicate topic. It manages to establish an emotional relation with readers.